Home educators are accustomed to living counter-culture. Their lifestyles go against the grain within their community, their extended families, even within their churches. They live with this stigma of non-conformity because they dare sacrifice all to rear their children for eternity. A few brave families have taken this idea yet another step. Rather than simply leaving the mother at home all day to be the primary educator and trainer of their sons and daughters, these visionary men have exited the corporate world forever to personally mold their own legacy. These are true entrepreneurs, risking their financial stability for a wealth they deem far greater than gold, working in pursuit of a bold, new enterprise. Entrusted with Arrows:Entrepreneurial Homeschool Fathers is the challenging, 60 minute documentary produced by Greg Lammimen and Movie Makers highlighting 5 such families. This film explains how important Dad is within the home, with weighty statistical proof for why his influence – or lack of it – is more crucial to a young person’s upbringing than even that of the mother. God placed fathers as leaders in the home not only to teach children entrepreneurial skills, work ethic, and financial principles, but more importantly to ensure the continuation of the family’s moral and spiritual values. These five families are seeking this inheritance above all else. Entrusted with Arrows is an honest look at the difficulties such a life-changing decision had on these families. Wives were interviewed as well, and the word “fear” was used often to describe how they felt when the salary ended and home business began. Yet each member was clearly willing to sacrifice for the financial, spiritual, and moral stability of the family. Time and again praise was given to the God that provided for each need. How do I choose my business? What steps should I take to begin my business? Will my needs be met if I quit my job? How can my wife help? Each man interviewed offered sound financial advice and biblical encouragement to get started. My husband and I watched Entrusted with Arrows together one evening over a pint of chocolate ice cream. We both came away challenged in our view of rearing our family and encouraged to pray over our own future plans. This is a documentary every couple, home educating or not, should view and pray over together. 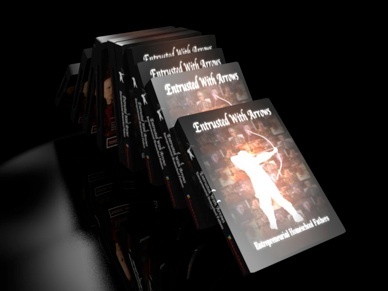 You can buy Entrusted with Arrows: Entrepreneurial Homeschool Fathers on DVD for only $19.99 from their website. Comment below if you would like to see Entrusted with Arrows for a chance to win your very own copy! For additional chances to win, simply tweet, facebook, or blog the links to this review and giveaway. Please leave a separate comment below for each action, mentioning your twitter name, facebook link, and/or blog account, so you will get your additional entries. You may enter one tweet, facebook post, and blog post each day until the contest ends Saturday morning. So keep publicizing the giveaway, then come back and leave comments below telling of your activity. One winner will be chosen at random this weekend. Watch the blog closely for your name! Sounds like a great resource! Thanks, Greg, for making it. Can’t wait to see it. Cannot wait to see this great looking documentary. How challenging to us all to see what these men and families are willing to give up to raise solid children. I’m curious..have several questions…the first being, “how does working from home allow the Dad to have MORE TIME with children?” A job is a job, whether you commute to work or not you still gotta work. SOooo, I would love to perhaps win a copy of the DVD, it looks very inspiring and interesting. It’s amazing how God gives such vision and dedication. Count me in the drawing, and thank you to those who were so generous. You can perhaps get a glimpse from the previews above some of the answer to your question. The average father spends nearly an hour just commuting to work each day; that alone is time most would rather spend with their families. In the cases of these 5 families, they are staying home so they can be active participants in the home training of their families; the children are part of the business, the father is the leader of the education and training day-to-day. It is a different view of the work/home balance that families grapple with, and quite inspiring to consider. This looks very interesting and I think my family could benefit from watching it. Please include me in the drawing. Hmmm….this sure came out at a good time…that’s something Corey has been thinking of recently. We’d love to grab a copy of it! I put it on fb too!!!!! I think I may know one of the men in it. I’m going to have to find out! This looks amazing! I’d love to add it to our collection of videos and have it to reference as our little ones grow older. Thank you! looking forward to winning this documentary video. What an interesting concept to think that fathers can be such a powerful practicial influence in the lives of our kids. Wow…sounds challenging and thought provoking. Would love to see it! Looks very interesting. It would be great to win and share with others I know. Thanks for the chance at winning. This documentary was so good. Awesome idea to have this giveaway. Shared this on my blog. Would like to see this, though I understand the “fear” and not sure I should let my husband watch it just yet, ha ha! This is a very thought-provoking documentary. It challenged me in my thinking – and faith – as my husband kept saying, “See! Isn’t that what I keep saying to you?” all the way through it. I better understand what motivates these men to make such lifestyle changes, and I hope I have the same spirit of sacrifice in my own calling as a wife and mother. Sounds interesting! I’d love to win a copy! I would love to win this, very interesting and it would be great to watch in this time of my family’s life! I would like to win this. It sounds quite thought-provoking. Would love to have a copy! Thanks! Who do you know, Dovey? That is great! entering again! i really want to win! I’d love to have an opportunity to win. Thanks for the offer! Today is the last day for my friend’s giveaway at her blog! I love your blog lots of useful information. I’ve added it to my favorite bookmarks and subscribed in a reader. All these issues are important, and that’s why I just started blogging a while ago and it feels great.